Here are some research links that may be useful for research projects on animals and their classification. This kid friendly website provides information about the various animal classifications and allows you to quiz yourself. Kid friendly presentation on Prezi about animal classification. Play this interactive game to learn about various ways that scientists categorize animals. 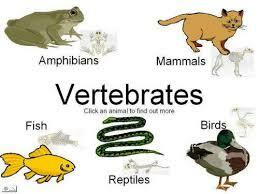 A vertebrate is an animal with a backbone and aninvertebrate is an animal without a backbone. The most common type of invertebrate are the millions of insects that crawl, fly and swarm around the globe. There are also many invertebrates that live in the ocean, such as jellyfish, sea urchins and more. You can visit StudyJams to view aninvertebrate slideshow and their vertebrate slideshow. Both links allow you to take a quiz to show what you have learned.